The perfect way to create an impact. Classy & Rich looking business cards with a wide choice of media and additional coats. - Starting at Rs. 500/- for 100 cards. Your business has need of affordable, Double Sided Business Cards? Reliable Prints, offers high quality premium business cards that are dual sided and of superior quality that matches your business standards. Take full advantage of the meeting with your prospective client and opportunities that lie in store for you and your company with your business identity printed in premium quality to leave a lasting impression. Business cards are the first touch point between you and the prospective client and a business card can certainly make or break the much coveted opportunity. If you do not get your business card rightly done, you may lose out on a lot of new business prospects awaiting you. 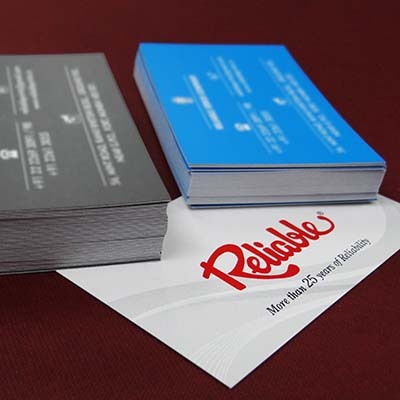 If the printing quality of double sided business cards is sub-standard it can definitely affect the perception your clients may have of you and your company for years to come. Exchange up-to-date contact information on your premium business cards. Changed office recently? Have a new address? Make sure you print new cards to convey that to your clients and people you exchange business cards with otherwise. Scrapping or pasting paper to reflect the new address does not speak high of you or your business. If you are a new start-up, make a lasting impression with your business cards at the very first meet is all the more important. From 350gsm gloss art card to matte art card to even 270 gsm natural cards and kentex ivory cards, we have an option to suit your taste and style. Not just type of paper media you can even customize the business card size from 89.9mm x 50.8mm (3.5 inch x 2 inch) to 85mm x 55mm to 92mm x 54mm. prices. Think no further, place the order for premium double sided business cards today.